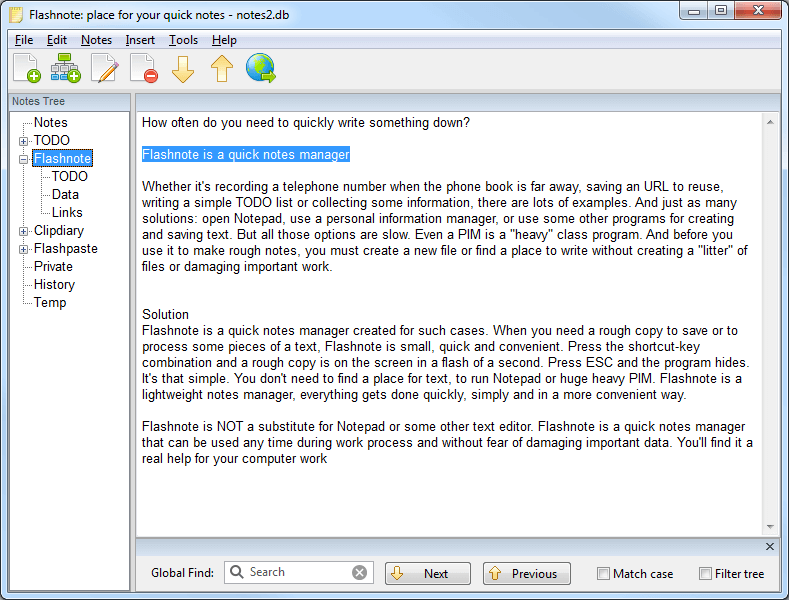 Flashnote is a quick notes manager for saving and organizing notes in a hierarchical tree structure. It supports word wrap, URL detection, search inside notes and global search, multiple databases, database back-up, restore and synchronization, export of notes, database encryption (AES-256) and more. How to extract: Download the "Portable" ZIP package and extract to a folder of your choice. Launch Flashnote-portable.exe. Added support for data synchronization between computers using cloud services like Dropbox, OneDrive, etc. Use Options -> Database -> Clone and Switch in order to move your database to the corresponding folder. For portable users: don't try to move the whole program folder into Dropbox, only the database file! Please note that this version does not support Windows XP\Vista.